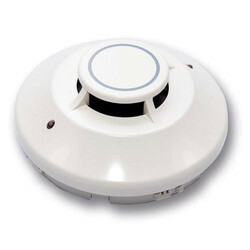 Known for our reasonable rates, we have come up with a world class assortment of Conventional Smoke Heat Detector. Model OH121 from Siemens Industry Fire Safety is a photo / thermal smoke detector that contains a thermal sensor. When the sensor is utilized, an Alarm condition will trigger when the temperature reaches 135°F at this point, the detector will also lock into Alarm condition. - Incorporate Fixed Temperatures and Rate of Rise of Heat Elements. - Twin Fire LEDs allow 360 degree viewing. Sharon Controls India Pvt. Ltd.
As per the needs and requirements of our clients, we are involved in providing Heat Detector. 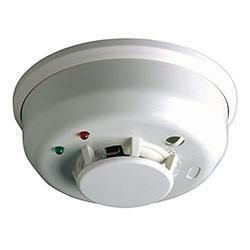 We are engaged in offering to our clients a wide variety of Fire Detectors installation services. The equipment used by us are procured from market trusted vendors, who assure of their quality. The Series 65 Heat Detector monitors temperature by using a dual thermistor network which provides a voltage output proportional to the external air temperature. There are 12 heat detectors in theSeries 65 range designed to suit a wide variety of operating conditions. Owing to our experts and rich industrial knowledge, we are keenly successful bin presenting Heat Detector.